Grab our 16,500 FT Skydive and enjoy 70seconds of freefall! 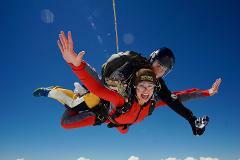 Grab our 12,000 FT skydive and enjoy 45 seconds of freefall! . 20 seconds of freefall – What a buzz! 20,000FT - Out of This World! OUR MIND-BLOWING ALTITUDE JUMP IS OUT OF THIS WORLD!